A monochromatic look is always in style. 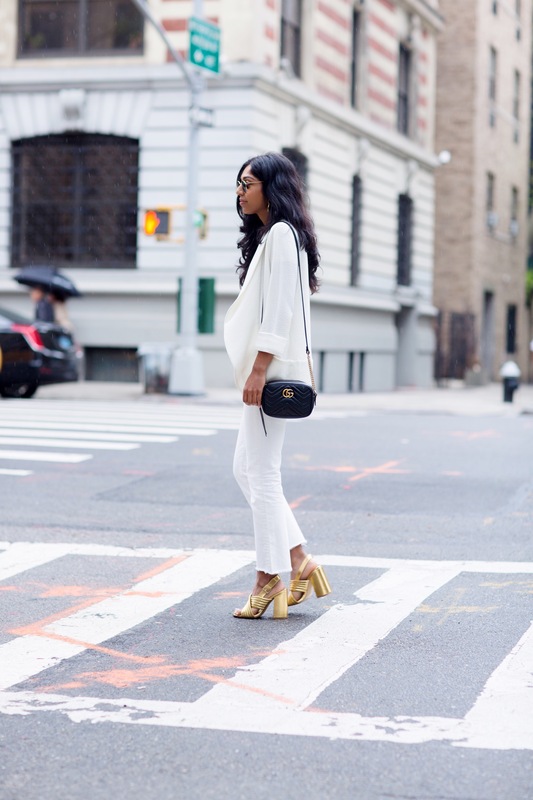 I love wearing all white — it always looks so classic and chic. For this look I rediscovered a blazer I have from Aritzia and completely gave it an update by pairing it with a white crew neck tee and my high waisted cropped Levi’s. This is my modern power suit. I’ve always been a denim lover and a pair of white jeans is a wardrobe essential. The frayed hem trend isn’t going anywhere for a while and this little detail helps show off what I call a ‘wow factor’ — these heels. I bought these shoes impulsively before a trip to Vegas with my sister and am so happy I did. The block heel is actually pretty comfortable and I love the shade of gold. The finishing touch? My Gucci crossbody. I have shared this item on my Instagram but haven’t blogged about it yet! After probably a year long thought process of what designer bag to splurge on (many conversations, focus groups, lengthy group texts with my sisters) I finally decided that this Gucci bag was what I wanted most. The classic camera style is perfect to fit my necessities; iPhone (Plus), mini wallet, metro card and a lip color. I am obsessed with the gold hardware and am excited to officially start my designer handbag collection….which could be dangerous. How will you wear all white everything this summer?